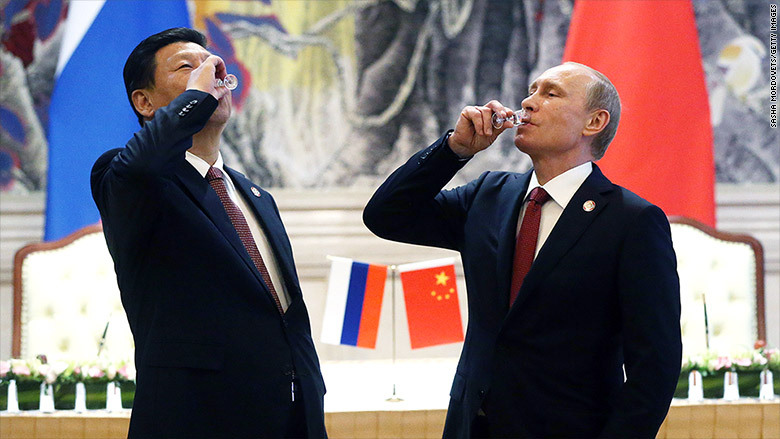 Russia's Vladimir Putin enjoys some vodka with the Chinese President Xi Jinping. Exports of Russian vodka slumped more than 40% last year, according to a report in Russian business newspaper Kommersant. It was the lowest level in a decade, the paper said, the result of Western sanctions imposed because of the conflict in Ukraine. Revenues from the exports of vodka and other spirits slumped 40% to $111.9 million, Kommersant said, citing official customs data. Shipments to the U.K., the biggest export market for Russia's vodka, were down 35% in 2015. Sales to the U.S. dropped 22%. The newspaper said exports of Russian vodka were down in every market, but shipments to Ukraine dropped the most -- by 70%. The relationships between Moscow and Kiev remain strained after Russia annexed Crimea in 2014. Russia has a long-standing problem with vodka. The World Health Organization said the country has one of the highest numbers of alcohol-related deaths in the world. The organization says an average Russian consumed 15.1 liters of pure alcohol in 2014, the fourth highest amount in the world.